Free Chick-fil-A on Cow Appreciation Day! Just wanted to let you know how to get free chicken from Chick-fil-A on July 11th, 2008. Basically, you wear either a cow costume or cow-related attire in a Chick-fil-A and you can get FREE food (breakfast, lunch, or dinner). If you wear cow gear from head to hoof you get a free combo meal, partial cow attire will earn you a free entrée. Want to take part but not sure what to wear? Here’s a tip: Simply darken your nose and/or mouth area with face paint/make-up to simulate a cow nose and wear horns/ears with this look. //firing up the grill to BBQ some beef ribs and some Chikn. No, I did not dress up but most of the youth group did! I’ll just use my coupon from my Chick-fil-a calendar and save myself the embarrassment, though! 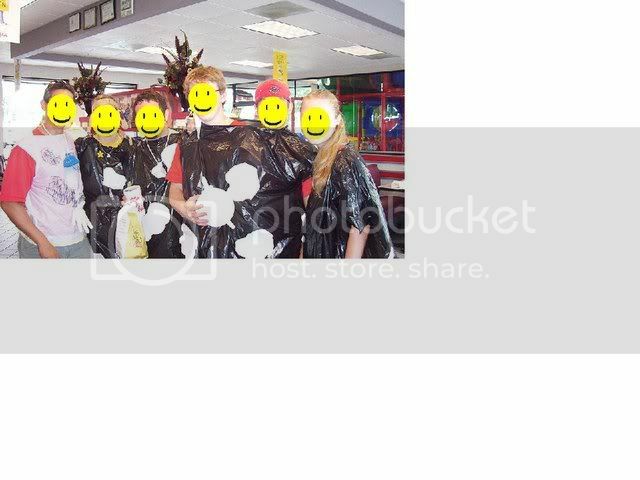 Its fun to take a group of kids dressed up like cows. All you need is scotch tape, trash bags, white paper, and surgical gloves. Probably more fun if it’s against their will. Is July 11th a Sunday? That would be such a cruel fate. It s a Friday. They can’t do it on Sunday! True, but as you can see from the above photo, they were quite happy to prostitute themselves for free food! Do you think my natural dog attire will pass for a cow? I’m brown, and I have a dark nose.